Former 800m world champion Mbulaeni Mulaudzi has been killed in a car accident in his native South Africa. 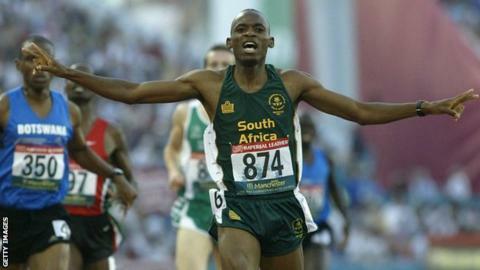 Mulaudzi took 800m gold at the 2009 world championships in Berlin and won silver at the 2004 Olympics in Athens. The 34-year-old, who carried his country's flag at the opening ceremony in Athens, retired in 2013. "Mr Mulaudzi was surely one of the most decorated track athletes that South Africa has ever seen," his agent Peet van Zyl said. The International Olympic Committee say Mulaudzi was on his way to a Johannesburg athletics meeting when he died. IOC president Thomas Bach said Mulaudzi was a "true Olympian and a fine athlete". "Our sympathies go to his family and friends, and to the whole sports family of the rainbow nation of South Africa, " said Mr Bach. "A World Champion, he always showed huge commitment to his craft. He proudly represented his new nation around the world, and at home his successes inspired a new generation of young people to take up sport. He will be missed by the Olympic family." The Transvaal Province runner won gold at the 2002 Commonwealth Games, bronze at the 2003 World Championships, followed by gold at the 2004 World Indoor Championships and silver at the 2004 Olympics. Mulaudzi went on to win two more medals at the World Indoor Championships, taking silver in 2006 and 2008. He won the 800m title at the World Championships in Berlin in August 2009, then set a personal best of one minute, 42.86 seconds in a race in Italy two weeks later. Mulaudzi did not compete globally after 2009, but remained on the athletics circuit until 2013.